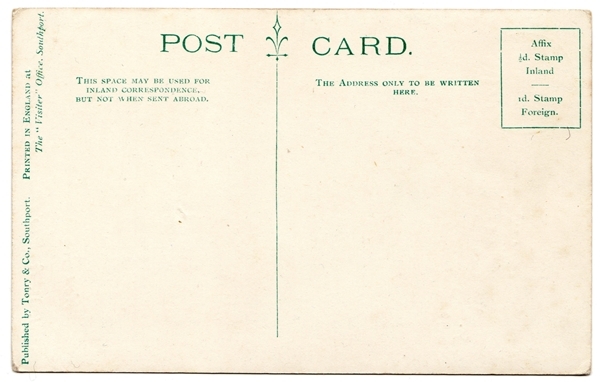 Lytham & St.Annes on the Sea Lancashire - Local History - -----"WE SHALL HAVE RAIN"
YOU ARE HERE > HOME PAGE > WEATHER STORM & FLOOD > -----"WE SHALL HAVE RAIN"
In Victorian Britain many shops selling umbrellas or waterproof clothing began using the slogan "WE SHALL HAVE RAIN". This was also the case in Lancashire towns, but a number of these were shops owned by the "New British Rubber Company" which from about 1897 was based in Southport. At various times between the 1880s and the early 1930s the New British Rubber Co., had branches in Bolton, Burnley, Southport, Liverpool, Wigan, Preston, Lancaster, Blackpool & St Annes-on-Sea. Here are some vintage adverts. Advert for the New British Rubber Company, 1891. Branches at Burnley, North Pier, Blackpool, The Arcade, Southport and Bolton. "We shall have rain.... Well, let in the rain: we are all right. 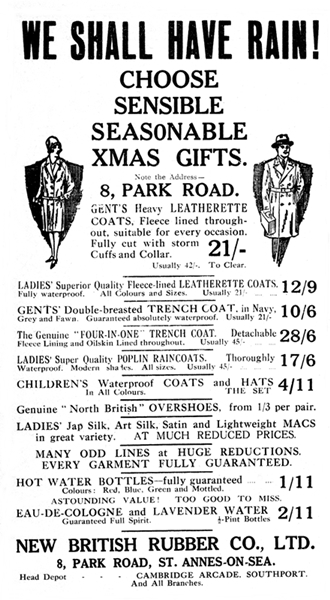 Rubber Co.'s Coats are watertight." Advert for the New British Rubber Company, 1891. Branches at: Burnley; North Pier, Blackpool; The Arcade, Southport; Bolton. A rather odd advertising postcard, promoting the New British Rubber Company's branch at St. Andrew's Road, South, St Annes, 1909. It is artist-signed "Tonry", published by Tonry & Co., Southport and printed by The Visiter Office, Southport. In 1909 there was a craze for roller-skating and rinks opened all over the country.1. Advert for the New British Rubber Company, 1914. The "Arcade", London Street & Lord Street in Southport; Standishgate, Wigan; Ranelagh Place, Liverpool. 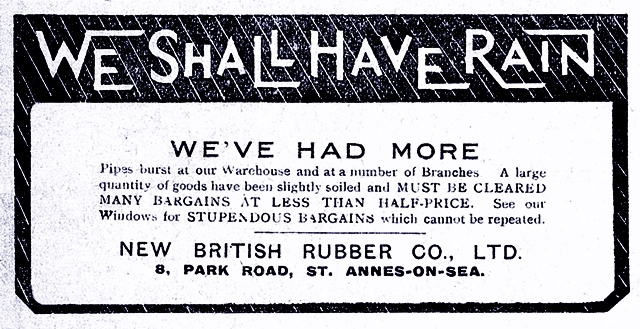 Advert for the New British Rubber Company, 1915. Branches at: Lord Street, Southport; Standishgate, Wigan; Opposite the Adelphi Hotel, Liverpool; Talbot Road, Blackpool. 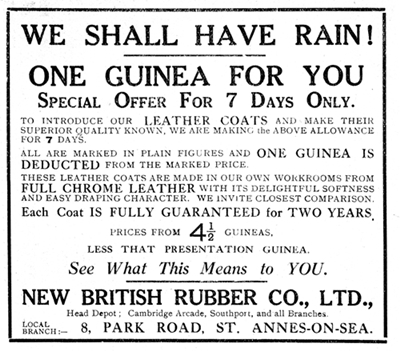 Advert for the New British Rubber Company, 8, Park Road, St Annes-on-Sea, 1929. Advert for the New British Rubber Company, Queen's Buildings, Fishergate, Preston, 1929. The "New British Rubber and Wearwell Hose Pipe Company, Limited, Southport" appears to have ceased trading about 1932. New British Rubber Company's shop, Standishgate, Wigan (just visible on the corner). Goodwin Bros (umbrella sellers), Orchard Street, Preston c.1969 (fourth picture on the page). Goodwin Bros. Umbrella Shop, Preston, 1979. Healthrack, previously Goodwin Bros (umbrella sellers), Orchard Street, Preston, 2009. 1. 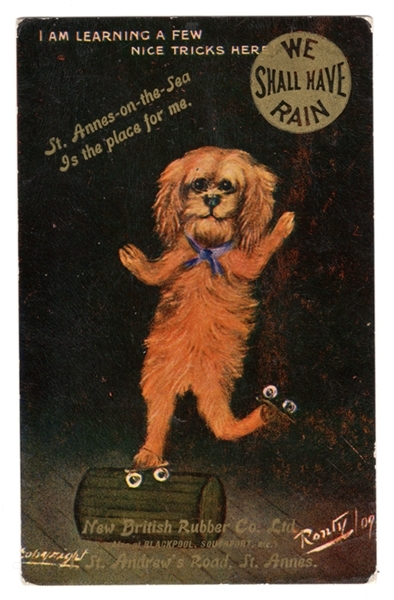 The Edwardian Roller Skating Craze. A report which comes from Blackpool is to the effect that “roller skating is killing everything.” While rinks are packed to excess, the theatres, ball rooms, and amusement houses are very sparsely attended, affording conclusive proof that there is a considerable amount of truth in the complaint. Four spacious rinks are already in full operation at the seaside resort, and others are in active preparation. The pastime is certainly an exhilarating one and one wonders whether the two rinks which are in course of preparation in our own town will exercise the same attractive force and give rise to similar complaints from existing places of entertainment. FOOTBALL ON ROLLER SKATES. A football match on roller skates, in aid of the fund to reduce the debt of Southport Central, has been arranged for Shrove Tuesday at the Winter Gardens [Southport] rink. Yesterday, on the same slip, there was a match between Central and "The Butterflies" Company, and Miss Ada Reeve kicked off, and the game resulted in a draw of four goals each.